The Pittsburgh Penguins continue to roll on in the Eastern Conference and they're doing so on the shoulders of their captain, Sidney Crosby. Despite a very slow start to the season for Crosby, this is his second Player of the Week nod in the last five weeks, after he finished Week Twenty-Two with a pool-high 9 points. Thanks to the huge snow storm that ravaged the Eastern seaboard earlier this season, the Pittsburgh Penguins had one of their games rescheduled to this week, which meant that they played five games in the week and Crosby made good use of them. Crosby finished with points in all five games, starting with 3 assists against the Coyotes, 1 assist against the Capitals, a goal against the Rangers, 2 goals against the Flames and finally, 2 assists against the Devils. Overall, Crosby has now lifted himself up to 11th overall in pool scoring, now scoring over a point-per-game with 65 points in 64 games this season. At this point in the season, he is still somewhat of disappointment, taken 2nd overall by Mike, who would have much rather have preferred his top pick to lead the pool in scoring, since the 1st overall pick in the draft hasn't played since December. That likely won't be the case this year, since he's well behind Patrick Kane, but at least the pick has been made a little bit more respectable this year. It's a bit too bad for Derek W., that he's getting his first Mover & Shaker nod of the season at this point of the year, as it doesn't make his team any more competitive in the money race, but nevertheless, it's always better to get a Mover & Shaker nod at any point in time during the season, rather than finding your team in the Basement Dweller spot. Thanks to a 35-point week, Derek won't have to worry about that for now. With the big week, Derek's team moved up from 15th to 13th, staying in the same sort of area that his team has been floating in since Week Fifteen, when his team dropped out of the top 10 and has just found its average. 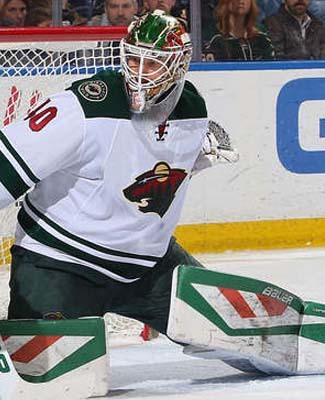 His team can attribute the big week to Devan Dubnyk of the Wild, who led his team with 6 points in the week, while Craig Smith of the Predators had 5 points and then Antoine Vermette of the Coyotes and Steve Mason of the Flyers each had 4 points. The biggest battle that a lot of teams are dealing with in this last segment of the season has been injuries and Derek's team has had to sit through a couple of major injuries this past week, as he had two guys on the Injured Reserve all week and still made it up into the Mover & Shaker for the week. That has to give some hope to a few teams that are really looking to make that last move, but are being hindered by some hurt players. With only five weeks left in the season, Derek now sits 39 points out of the money and his team was only 3 points better than the 3rd place team this week, so at that rate, there is no chance of making it up to the money, but there is certainly a chance for a top 10 finish, for whatever that's worth. It was a pretty close race for the Basement Dwelling teams and it was a photo finish at the end of the week, as two teams finished up with 14 points a piece, so we'll go to the tie-breakers to figure it all out. Both Derek & Dan's and Cindy's teams finished with 14 points and at a 7-5 margin in goal scoring, Derek & Dan fall to the Basement Dweller, being on the wrong end of that tie-breaker. If it wasn't for their Flames defenders, the pool's third duo would have a had an exceptionally poor week, as Dougie Hamilton and Mark Giordano combined to pick up 7 points in the week, Hamilton being the better of the two with 4 points in the week. Their team has been hurt a bit by injuries in the past few weeks, as Marian Hossa of the Blackhawks has been on the IR for a while now and Jakub Voracek of the Flyers missed the better part of the week with an injury, though not on the IR. In net, Henrik Lundqvist of the Rangers failed to pick up any points, thanks to some neck spasms. Derek & Dan's true passion down the stretch is the PIM pool, which will be covered shortly, but it didn't really suffer too badly, but didn't dominate at the end of the week, like they would have preferred. On the plus side, they're not in last place in the standings, so there's that. Holy Dinah! We've got new representation in the money spots this week. John P.'s team is sputtering badly and both Brian and Neil have moved passed him, with Brian now occupying 3rd place, only 1 point better than Neil and now 4 points better than John. How exciting! The race there is really heating up. How about a new leader as well?!? Brenda & Seward ended Jeremy's 3-week streak in 1st place, re-taking the position for the first time since the end of Week Eighteen and they will open Week Twenty-Three with a 4-point lead and some pretty hot players at the moment. Brian not only took over 3rd place in the pool standings, he also held the weekly lead for penalty minutes in the week as well, earning 35 PIM in Week Twenty-Two, just a single minute better than Derek & Dan. Derek & Dan's team finished as the best of the goon teams, edging out Wes' team by only 4 minutes and down his lead to 31 minutes with only five weeks to go. Derek & Dan got off to a pretty good start with some Zack Kassian goonage, but they were unable to follow it up with any sort of help. Still, they have a chance to catch Wes, but his goons are hanging on as well. In the weekly numbers for the rookie pool, Ryan's riches were rather embarrassing in Week Twenty-Two, as his freshmen finished with 10 points in the week. Connor McDavid of the Oilers, Artemi Panarin of the Blackhawks and Robby Fabbri of the Blues were all picking up points for his team, as they're actually carrying him through to the conversation to the overall money, as his team is still only 15 points behind. Scoring was kept to a reasonable rate in the week, where the pool was collecting 12.6 points per NHL game in the week, which was actually quite good, considering injuries and suspensions knocked down participation in both skaters and goalies in the week. Rough-housing went back up a bit, up to 10.2 PIM per game, which was good, but we're just not feeling the desire there. For Sunday's game between Detroit and Chicago, Red Wings forward Pavel Datsyuk was feeling under the weather and couldn't dress for the game. He is considered day-to-day for right now and should be expected for their next game, Tuesday night in Columbus. Cindy's team managed to avoid the Basement Dweller nod by the skins of their teeth this week and Datsyuk's absence certainly didn't help. Of course, it didn't hinder that situation, because her team didn't get the nod. The Islanders are still rolling with three goalies on their roster and now that the roster doesn't have the 23-man limit, it will continue to house three keepers. On Sunday, Thomas Greiss, who is slowly working his way into the favour of the coaches, was the healthy scratch against the Rangers, as Jaroslav Halak started and J-F Berube acted as his back-up. This isn't a big concern, rather it is more of a help to Eric's keeper, as he doesn't have to work extra hard to be the back-up, more worry about the games he's called upon to start. Eric's team is currently 25 points out of the money and needs Greiss to get the bulk of the starts down the stretch to close that gap. It sounds like the Penguins have another concussion issue that they're dealing with, as Carl Hagelin apparently didn't pass the concussion protocol tests on Sunday, ahead of their game against the Devils, which made him into a scratch. If that is indeed the case, Hagelin will miss the better part of this week's action, likely not eligible to return until Saturday, but we are waiting for official word from the team. For now, he'll be day-to-day, but we're monitoring this situation. Dale C. had a pretty good week from his team, which ended up with 27 points in the week and moved up to 12th, only 12 points out of 10th. It's way too far of a distance for the money, but a respectable finish would be pretty good too.